LabVantage Pharma is the world’s only pre-validated and preconfigured pharmaceutical LIMS. Dramatically reduce the time and cost, typically spent on a traditional LIMS implementation, by using LabVantage Pharma, a pre-packaged solution that leverages GAMP 5 Industry Best Practices. LabVantage Pharma is the ideal solution for laboratories in need of operational fully functional, validated LIMS. Who should use LabVantage Pharma? A traditional LIMS implementation can take 12 months or longer with most of the time spent in configuration, customization and validation. LabVantage has made this process faster and smoother with a preconfigured, industry-specific solution called LabVantage Pharma. The solution is built on LabVantage 8 and is pre-validated according to GAMP 5 guidelines. With LabVantage Pharma, you can go live in as little as 90 days. How is LabVantage Pharma a pre-validated LIMS? We used our years of experience implementing LIMS in the pharmaceutical industry to create LabVantage Pharma. This packaged solution is pre-validated, which means it has already gone through a full execution of the validation life cycle based on User Requirements, from IQ/OQ/PQ, to System Release. 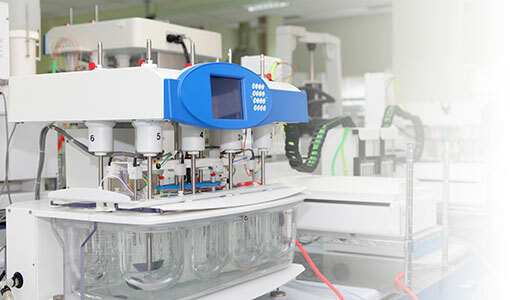 LabVantage Pharma is preconfigured based on industry best practices to support pharmaceutical specific workflows, such as batch management, stability testing, reagents and standards management, and barcode label printing. Other LIMS vendors do not provide fully executed validation, but instead supply only validation test scripts. These scripts then need to be rewritten to match the configuration and then executed. This adds substantial cost and likely does not cover the entire validation from the customer end. When you purchase LabVantage Pharma, you get complete evidence of the validation process for out-of-the-box platform. How can LabVantage Pharma be implemented so quickly? 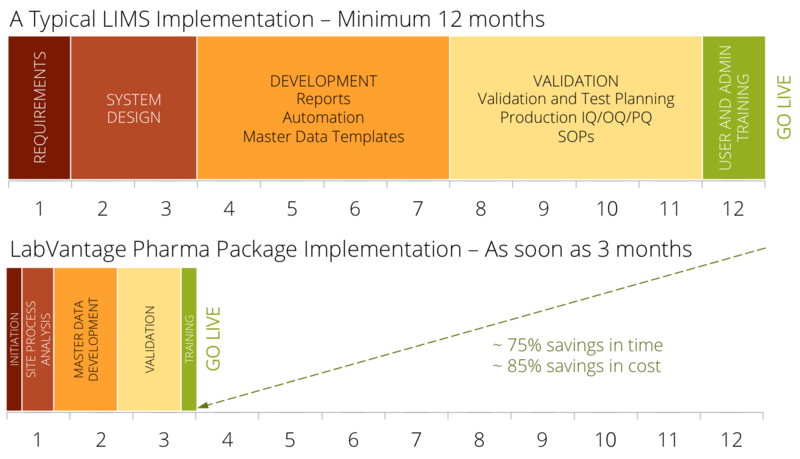 LabVantage Pharma saves time and costs in two areas, configuration and validation. Since we used common pharmaceutical user requirements to configure the solution, customers can use the system with minimal configuration changes. Offered as a pre-packaged solution, LabVantage Pharma acts as a project accelerator. The implementation focuses on training your team on the configured solution and in helping you gather and load the master data needed to operate the LIMS. By closely adhering to GAMP 5 guidelines, LabVantage Pharma easily integrates into your existing validation processes, minimizing and streamlining the effort to validate the LIMS. LabVantage 8 provides out-of-the-box support for quality control labs. LabVantage lets you manage the sample lifecycle, optimize laboratory execution, perform data retrieval, interface instruments and systems, and enable security and auditing. Thousands of labs across the globe use LabVantage to power their regulated laboratories and get consistent quality. Our customers span across industries and range from the Fortune 500 to startups.